REDDING, Calif. - Simpson University music professor Dwayne Corbin will be guest conducting the California Music Educators Association (CMEA) Northern Section Junior High Honor Band on Jan. 16. The annual event, held at California State University Chico, includes 66 of the most talented junior high musicians from across the North State, chosen by competitive audition. 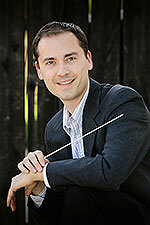 The conductor is selected by regional music teachers upon the recommendation of CMEA members. Dr. Corbin will also be leading the North State Symphony in four youth concerts, Jan. 20-22, in Chico, Redding, and Red Bluff. These “Symphony Around the World" performances for students will feature music from nine locations on four continents, plus Tan Dun's global work, "The Internet Symphony,” originally commissioned by YouTube in 2009. More information is available at NorthStateSymphony.org. In addition to his role as associate professor of instrumental music at Simpson University, Dr. Corbin is also music director and conductor of the Shasta Symphony Orchestra, a cooperative ensemble of Shasta College and Simpson University.